Bob and Robin Martin, Kim and Ray Celedinas and Sara and Geoff Peckham at The Benjamin School’s 2012 BASH. 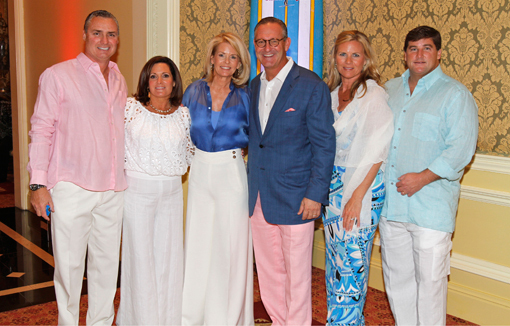 PALM BEACH, FL – Rain didn’t dampen the spirits at The Benjamin School’s 28th annual BASH fundraiser, which raised more than $820,000 for the school. While the inclement weather drove the sold-out event inside The Breakers, the 380 guests still bid generously for items offered during silent and live auctions. The highlight of the live auction was the bidding for tickets to a Madonna show in Miami, donated by FPL, which garnered $27,000. Robin and Bob Martin and Sara and Geoffrey Peckham chaired the 28th edition of BASH (Building A Scholastic Heritage). 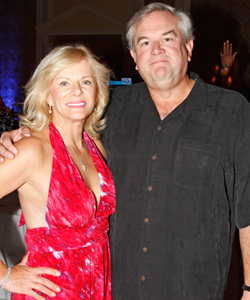 Ray and Kim Celedinas served as the honorary chairs. Sponsors of the program, held April 13, 2012, included Kim and Ray Celedinas, the Cline family, Amb. Al and Dawn Hoffman, Northern Trust Bank, Susan and Charles Barker, Braman Motorcars, The Gardens Mall, Robin and Bob Martin, Sandy and Joe O’Connor, Sara and Geoff Peckham, Natasha and Dirk Ziff, David G. Lambert, Jack and Barbara Nicklaus, Debra and Ivan Ross and the Stantonfamily. The Benjamin School, founded in 1960, is a PK3 through 12th-grade independent school that focuses on college preparatory education. For more information, visit www.thebenjaminschool.org.